We’d love your help. Let us know what’s wrong with this preview of The Wheels of Samsara by Tim Pyke. The Golden Age of Man is returning. John is stuck in a rut. With no direction and plodding his way through a seemingly mundane life he is resigned to his boring existence. After being involved in a bombing on the London underground he has a near death experience in which he meets Leela, a divine being. She reveals to him that he has an important role to play in the coming s The Golden Age of Man is returning. John is stuck in a rut. With no direction and plodding his way through a seemingly mundane life he is resigned to his boring existence. After being involved in a bombing on the London underground he has a near death experience in which he meets Leela, a divine being. She reveals to him that he has an important role to play in the coming shift of Ages, but he has become lost and must find the right path. Taking up yoga gives him a renewed energy and focus in life. This new path takes him to India where he discovers an ancient temple dedicated to Leela. What he learns there overturns everything he thought he knew. Travelling deep into the south Indian jungle he meets a powerful yogi. With him he learns the secrets of yoga, how to access latent powers through the awakening of his third eye and what his role is in the coming earth changes. To ask other readers questions about The Wheels of Samsara, please sign up. We join John as he is facing a turning point in his life. As the novel begins he is restless, enduring a job and existence that he feels is unsatisfying. He attempts to make the best of the situation, but the path he has been funnelled down increasingly presents itself as being a betrayal of what he is uncertainly longing for. Then he is involved in a violent event and its aftermath sends him at urgent speed to question the foundations of his views of the world. There are some really evocative to We join John as he is facing a turning point in his life. As the novel begins he is restless, enduring a job and existence that he feels is unsatisfying. He attempts to make the best of the situation, but the path he has been funnelled down increasingly presents itself as being a betrayal of what he is uncertainly longing for. Then he is involved in a violent event and its aftermath sends him at urgent speed to question the foundations of his views of the world. There are some really evocative touches in this novel, and I found the exploration into yogic spiritual practice very interesting. The explanation of the principles of the discipline and how these altered states are achieved were weaved into the narrative well. The novel takes the form of a self-actualisation exercise before moving on to address themes of self-transcendence. Not being at all familiar with yoga I’ve no idea if the version presented here is accurate in its representation or not, but there is an authority to the authorial voice which is very convincing and suggests that the basic framework is an authentic one. This grounding assists later in the novel where the story embraces more metaphysical areas. I found the latter portion of the book more compelling, as its cosmological elements appeal to my personal sensibilities. The tone of the novel, including its ventures into more esoteric spheres, is a measured one. The writing has a quiet pull to it. I have some misgivings, the principle of which is that sometimes the dialogue scenes were set up with John as a persistent inquisitor, and his opposite interlocutor the deliver of information. Whilst it is understood that John is in a questing frame of mind, this did become noticeable in a few places. First of all, I loved the cover. It gives you a soothing feeling — very much in line with this beautifully written story. Reading it felt more than just reading, it felt like going thru a journey of spiritual unfolding. The protagonist of the story John depicts the true face of the common man, his life events drove him to shift his focus from materialistic pleasures to yoga and philosophy. It’s an entertaining and peaceful read. Great work by the author! An enchanting tale dealing with transformation and awakening, an in-depth delivery about a side of yoga far removed from the current rendering that promises mere physical gains. Tim recounts deep truths about the hidden, spiritual powers of yoga in an entertaining romp through India that captures and holds the reader’s attention right up to the very end. For me, the book could also be seen as a metaphor for the final awakening, the letting go of illusions, the ensuing dark night of the soul, and t An enchanting tale dealing with transformation and awakening, an in-depth delivery about a side of yoga far removed from the current rendering that promises mere physical gains. For me, the book could also be seen as a metaphor for the final awakening, the letting go of illusions, the ensuing dark night of the soul, and the reemergence into the Truth. Wow! What a story that was. I'm not a religious man and I don't really get all that spiritual mumbo-jumbo, but I'm now sold on the powers of yoga. In the old days when I had money I used to go to yoga classes and I remember how relaxed I used to be afterwards, but that's all I did, I didn't do any meditations and repeating mantras, I wish I had though. This book is about John who has a spiritual awakening after being involved in a terrorist attack... victim not perpetrator... during his recovery Wow! What a story that was. I'm not a religious man and I don't really get all that spiritual mumbo-jumbo, but I'm now sold on the powers of yoga. In the old days when I had money I used to go to yoga classes and I remember how relaxed I used to be afterwards, but that's all I did, I didn't do any meditations and repeating mantras, I wish I had though. This book is about John who has a spiritual awakening after being involved in a terrorist attack... victim not perpetrator... during his recovery he asks himself what is he doing with his life and what's the point in everything. So he starts reading up on things and after not getting answers that make sense to him from the church he comes across a yoga class. And so begins his quest. The rest of the story is set to an end-of-days backdrop, as the world is coming apart at the seams John is getting closer and closer to finding out his reason for being. A large amount of the story is set in India, starting off in the busy cities and gradually finding its was into some tranquil paradises. Tim Pyke has a lovely descriptive writing style, he has a scary ability to transport you to these places in only a few short lines. The other part of his writing style I enjoyed was his method of getting across quite a complex belief, John asks simple question after simple question, the sort of questions I would normally ask and then be frustrated by the lack of answers, here though Tim gives you those answers and in a way that is simple to understand and doesn't wander off into eye-rolling silliness. The finale to the book is spectacular, and if only you could have CGI in a book, it would have been amazing to watch. I feel that people who are interested in Hindu mysticsm and yoga maybe interested in this narrative. This is not an action packed book, so if you are looking for guns a blazing then this is not for you. It is for the most part a quiet story of a man and his quest. It feels somewhat autobiographical in nature, especially the beginning half of the book and the protagonist undergoes a major trauma. The last third of the book is much more magical in nature. But is all based in Hindu mythos, so also I feel that people who are interested in Hindu mysticsm and yoga maybe interested in this narrative. This is not an action packed book, so if you are looking for guns a blazing then this is not for you. It is for the most part a quiet story of a man and his quest. It feels somewhat autobiographical in nature, especially the beginning half of the book and the protagonist undergoes a major trauma. The last third of the book is much more magical in nature. But is all based in Hindu mythos, so also no fairies or dragons either. The Wheels of Samsara, by Tim Pyke, is a story of spiritual unfolding. It aptly depicts the subtle and insidious transformation that spiritual seekers ultimately perceive within themselves, though these inner changes are usually not as readily apparent to onlookers. The author takes the reader on a relaxing internal journey with the protagonist, named John, as life events propel him to shift his life's focus from things material to things sublime. 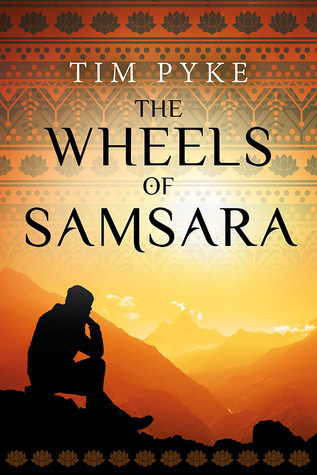 The book provides several services to its readers, The Wheels of Samsara, by Tim Pyke, is a story of spiritual unfolding. It aptly depicts the subtle and insidious transformation that spiritual seekers ultimately perceive within themselves, though these inner changes are usually not as readily apparent to onlookers. The book provides several services to its readers, one of which is an acknowledgement of the pitfalls a novice confronts in making a spiritual quest, specifically, the danger of spiritual charlatans which abound. I started reading this book from a recommendation with no expectations of what it was all about. I'm glad I did. What a beautifully written and calming story of one mans quest to become spiritually enlightened in a world of terror and chaos. As someone who has regularly meditated, I understood the calm that Tim was describing. However, now I quite fancy getting into it a bit more and also giving yoga a proper chance too. Not that I think it will give me the life that John sought out; I think we I started reading this book from a recommendation with no expectations of what it was all about. I'm glad I did. What a beautifully written and calming story of one mans quest to become spiritually enlightened in a world of terror and chaos. I was born in 1976, studied Physics at university and currently work for the National Health Service in London. I live in East London with my wife and cat. Since reading Chariots of the Gods by Eric Von Daniken when I was aged 14 I have been passionately interested in alternative and esoteric beliefs. I have been a long time subscriber to Fortean Times and avidly read a wide range of subjects covering spirituality, ancient histories and the occult. In addition to books I also love listening mainly to ambient and trance music, but also enjoy other types of musc. I have practiced Yoga and Tai Chi for ten years. Several years ago I spent six months travelling around New Zealand and India where I first had the ideas for a novel. I have always enjoyed writing and decided to try and write my first novel. I have now begun work on my second novel.